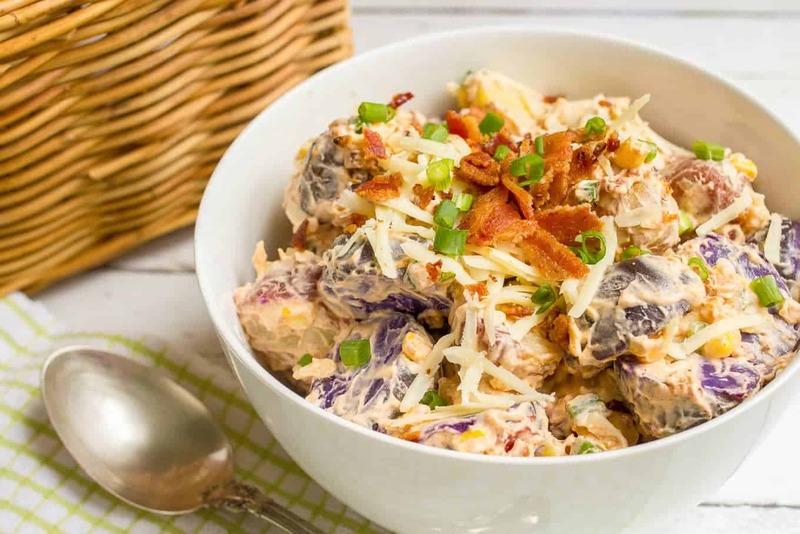 A perfectly creamy cheddar, corn and bacon potato salad using multi-colored potatoes for a red, white and blue side dish! Y’all know I love me some potatoes. Our go-to is my easy microwave baked potatoes but of course I love them roasted, mashed, smashed, mixed, however you want to serve them! And in the summertime, potato salad is a staple. It’s great for picnics, BBQs, holidays and any night when you’re grilling out. I love, too, that it’s make-ahead, so if we’re coming back from a day at the pool, it’s just ready for us while my husband throws some chicken or fish on the grill and I steam a vegetable. Ah, simplicity. Today I’ve got a fun, patriotic red, white and blue version for you in this cheddar, corn and bacon potato salad. It’s loaded up with deliciousness and will satisfy with every bite. Beyond the colors, the flavor here is incredible! 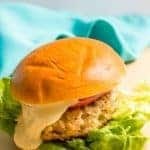 It’s perfectly creamy with the mayonnaise and Greek yogurt balance, plus a hint of acidity from the vinegar (my favorite trick for potato salad) and then the cheddar cheese adds another layer of creamy goodness that gets folded in along with some fresh summer corn. You’ve also got some subtle spice and smokiness from the cayenne and paprika and the gorgeous crunchy, crumbled bacon piled up on top. 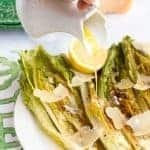 I’m not sure there’s a more appropriate side dish to serve for Memorial Day, Fourth of July, Labor Day or any of your summertime gatherings. Make sure your potatoes are all in an even layer in your pot when you cook them so that they cook through evenly. Also, don’t let them go too long. You want to be able to slice them without them falling apart into mush. Check starting at around 18 minutes, and every two minutes, until they are ready. I like to hit the cooked potatoes with vinegar while they’re still warm. They drink it in and it gives an easy depth of flavor that can’t be added in later. The bacon gets soft when mixed in and refrigerated with this potato salad, which I don’t really mind. You could save all of it to serve on top of the potato salad when you’re ready to eat or you can mix in half and reserve half, like I suggest here. And, I must say, this cheddar, corn and bacon potato salad goes exceptionally well with my cheddar chicken burgers from Monday. I’ve got one more great summertime and Memorial Day recipe for you coming on Friday, so don’t miss it! Also, don’t miss the Great Blogger BBQ round-up below! 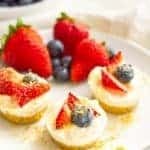 I’ve teamed up with some fellow food bloggers to bring you 50 recipe ideas for barbecue season, with everything from appetizers and drinks, to sides and mains to desserts! Let’s get to cooking! 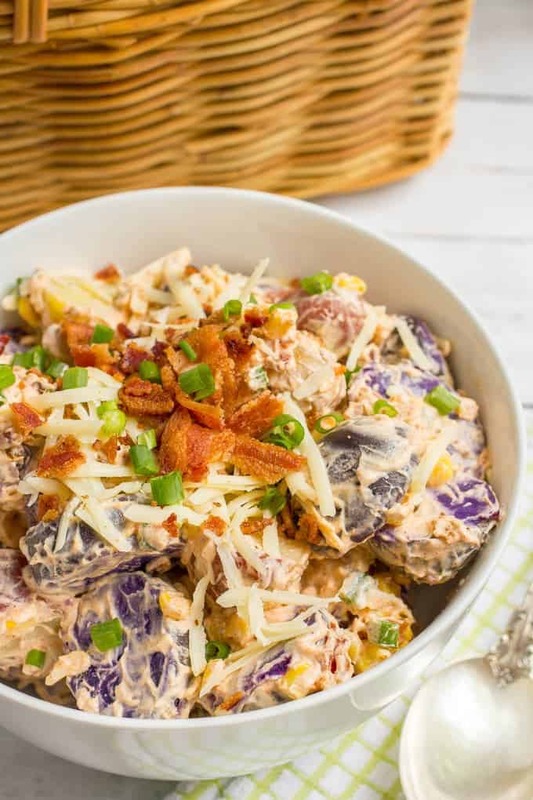 A perfectly creamy cheddar, corn and bacon potato salad using tri-colored potatoes! Cook whole potatoes in boiling salted water for 20-25 minutes, until almost tender. Be sure to use a big pot so they are in an even layer on the bottom. Drain and let cool slightly, until cool enough to touch. Slice the potatoes into 1/2-inch pieces and place in a large bowl. Pour 2 tablespoons of the white wine vinegar over the potatoes while they are still hot. Let cool completely. Meanwhile, cook and crumble your bacon and shred your cheese. 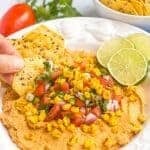 In a small bowl, mix together the mayonnaise, Greek yogurt, remaining teaspoon of white wine vinegary, sugar, paprika, salt, pepper and cayenne, if using. Stir until smooth. Add the mayonnaise and Greek yogurt mixture and stir until everything is well coated. Refrigerate at least an hour and up to 24 hours. When ready to serve, top with the remaining bacon and green onions. Enjoy! This potato salad is meant to be made ahead, so please plan accordingly. The bacon that gets mixed into the potato salad before it gets refrigerated will soften. You can reserve all of the bacon until you are ready to serve if you want to ensure it all stays crispy. So glad we’re on the same page 😉 Thanks Dawn! Don’t you just love the purple potatoes? So festive! Love the corn and the cheeeeeeese and the bacon too of course – all the good things in one salad! This has GOT to be like the ultimate of all the ultimate potato salads, right?! Love! Thanks Alida! It’s pretty epic! Girl, I do love me some potatoes too! I’ve never seen a potato salad quit like this before! I’m thinking it may need to make an appearance on my picnic table this weekend! I am right there with you in your love of potatoes! But really, what sane person doesn’t love spuds, right?! 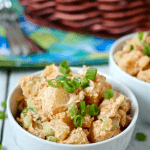 This potato salad is fabulous, Kathryn! 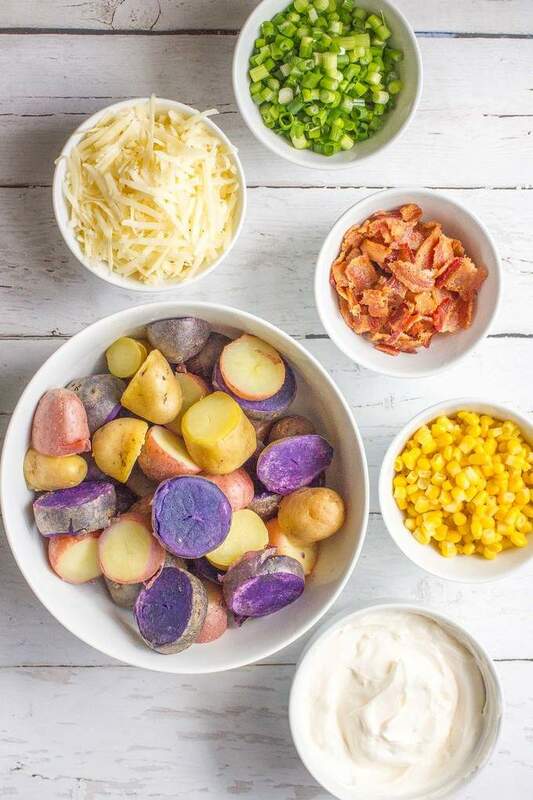 LOVE the tri colored potatoes in here – so patriotic! And I’ll take extra cheddar, corn and bacon please!! SO GOOD! Cheers friend – to a wonderful holiday weekend! It really helps! And sad, I wish I could send you some purple potatoes Adina! Gosh this would be amazing at a summer bbq…maybe even at a Memorial Day bbq! There’s really nothing as Patriotic as Bacon and Cheese! Thank you so much for sharing! Yay, thanks Brie! That quick splash of vinegar really adds great flavor! A few things: I’m super into potatoes, too. Purple is my favorite color. And I love food that I can prep early so I don’t have to run around like a chicken with its head cut off when entertaining. We sound pretty similar. Let’s be friends? This potato salad is elevated from the recipe I enjoyed during my childhood, and I am stupid excited to make your rendition. How could this NOT be delicious? I meaaaaaaan.. potatoes and corn and BACON all together in one dish? Hard to beat! Thank YOU for getting us all together – what a great virtual BBQ party! Just wish we could make it all happen (us and the food) in person! Happy Memorial Day weekend to you! What a BEAUTIFUL potato salad Kathryn! Can`t wait to make this for my next BBQ! 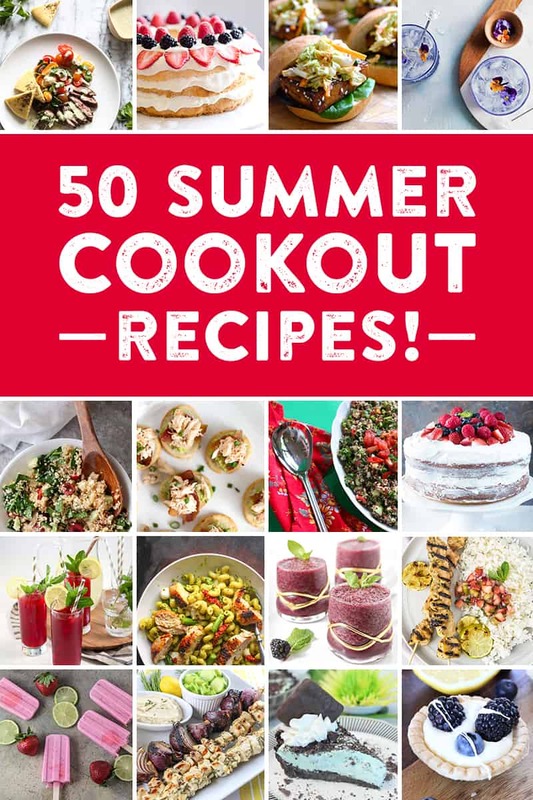 Also LOVING the 50 Cook Out Recipes! Have plans to make Katie`s Quinoa Tabouli by A Fork’s Tale tonight! Thank you Tez! It’s a great BBQ side dish for sure 🙂 And yes – Katie’s quinoa tabouli totally caught my eye too – hope you enjoy! Thanks Kelsey! Love that we’re fellow potato fanatics! Just wait until I show this to my Hubby tonight. He’ll want me to make it once a week! lol! No kidding, he LOVES corn and potatoes and bacon. OMG…BACON!!!!!! Too much love on one plate 🙂 Have a great holiday weekend! Haha, thanks Karrie! Hope he loves it! I must be living under a rock because I’ve never seen a purple potato! This potato salad looks like a real winner though – most potato salads I see are all the same variation of plain/boring-ness. You had me at bacon! Mmmm, my kind of salad! This looks absolutely delicious! 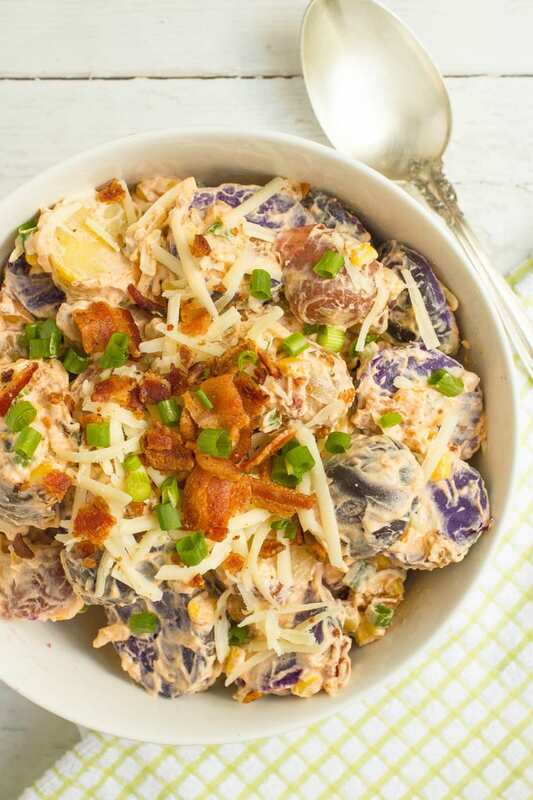 This has to be the prettiest potato salad I have ever seen! 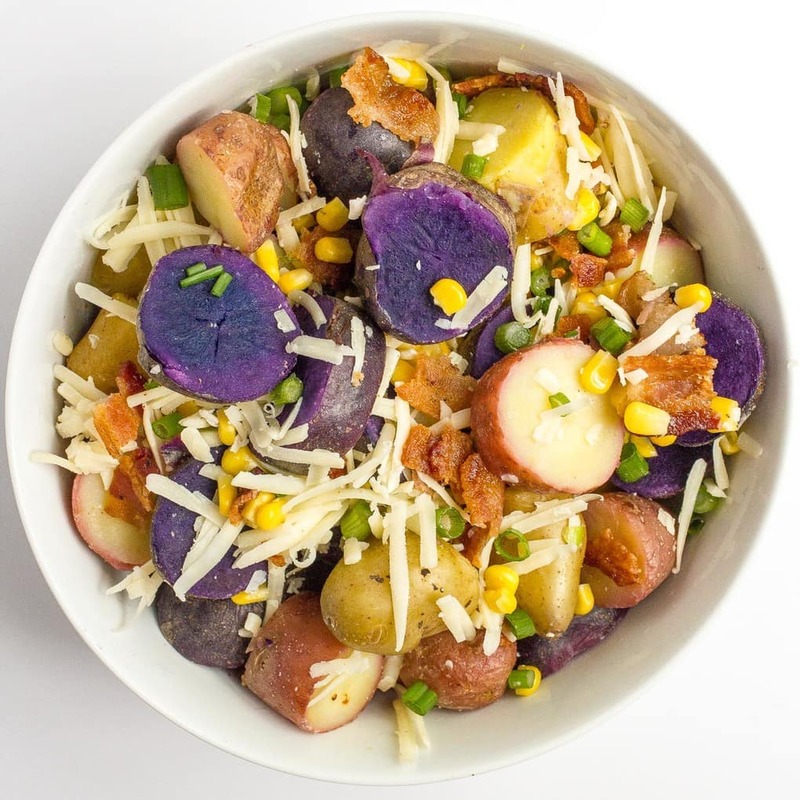 My kids would absolutely love the addition of purple potatoes. Putting this on my summer food rotation for sure. Thanks for the great recipe and including me in the summer cookout recipes. I’ve never tried purple potatoes before 🙁 They look so pretty. You’ve put all my favourites into one bowl – corn, cheese, bacon and potatoes – I’m happy! 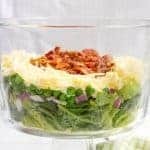 This sounds like a winning combination of flavors – I’ve never tried adding cheese to potato salad, but it sounds irresistible! I love the added color from the potatoes as well! Thanks for linking up at You Link It, We Make It last week and congrats on your feature today! This salad looks amazing. I’ll be pinning to our group board! This would be a hit at any potluck! I love that you have some good spice in there – and bacon!! Thanks for joining us again at Throwback Thursday! !